Vitellaria paradoxa is a small to medium-sized tree (min. 7) 10-15 (max. 25) m high; much branched, dense, spreading, round to hemispherical crown. 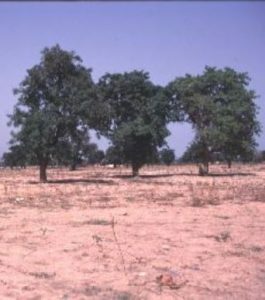 In mature trees the bole is short, usually 3-4 m but exceptionally 8 m, with a diameter ranging from 0.3 to 1 m, but most frequently 0.6 m. Bark conspicuously thick, corky, horizontally and longitudinally deeply fissured; protects older trees against bush fires. Slash pale pink, secreting white latex, as do broken twigs or petioles.